The latest candidate for attorney general wants to generate some buzz. 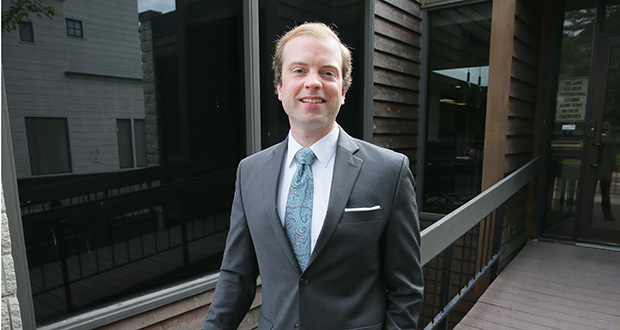 Noah Johnson, the Grassroots-Legalize Cannabis candidate for attorney general, is a 29-year-old Minneapolis attorney who got accepted to the state bar just a month ago. Johnson’s name was added to the Secretary of State’s official candidate web page on June 12, well after the June 5 candidate filing deadline. Johnson met the deadline, but third-party candidates must submit petitions affixed with at least 2,000 petition signatures. Those must be certified before the candidate qualifies for a spot on the ballot. For Johnson, that process took until June 11, according to the Secretary of State’s office. Now, he’s officially a candidate. “My party’s goal is to sort of bring the issue of legalization out into the limelight in Minnesota and sort of put a little pressure on the two major parties to focus on the issue, which actually has broad bipartisan support,” Johnson said Wednesday. His entrance makes Johnson the ninth person competing for the office being vacated by DFL incumbent Lori Swanson, who is running for governor. Republicans in the race include Sharon Anderson, Bob Lessard and Doug Wardlow — the GOP’s endorsed candidate. Keith Ellison, Tom Foley, Debra Hilstrom, Mike Rothman and Matt Pelikan — the DFL’s endorsed candidate — will square off in the Aug. 14 DFL primary. Johnson graduated from the Mitchell Hamline School of Law last year and says he has experience working with the ACLU and the Innocence Project of Minnesota. His campaign spotlighting marijuana legalization is similarly rooted in his sense of justice. Johnson initially contemplated running as a way of confronting Swanson over her opposition to legalized pot, he said. Swanson is currently the only DFL gubernatorial candidate who opposes marijuana legalization. On TPT-TV’s June 8 Almanac public-affairs program, Swanson said she will oppose legalization until she is persuaded that it wouldn’t result in increased traffic deaths. Now that Swanson is out of the attorney general race, Johnson’s new goal is to push the current crop of candidates, from both parties, to give the issue its due. He said he’d welcome an invitation onto the debate stage when the time comes — but acknowledges that’s unlikely. Formerly the Grassroots Party, Johnson’s cannabis coterie formed in 1986 and has been a recognized Minnesota independent party ever since. Its last statewide candidate, Bloomington computer repairman Chris Wright, garnered 1.6 percent of the vote in the race 2014 governor’s race. Wright—now sporting neatly shorn hair—is running for governor representing the party yet again this year. Thanks, Kevin! Love the article. Way to go! All the love to Keith Ellison but if he doesn’t have what it takes to stand against the ignorance, racism and special interests behind marijuana prohibition, we’ll need to do better!